Adventures with Maman to Pheonix, Sedona and Canyon Ranch Health Retreat. I like writing when I travel. And so I do. We woke up to a cloudy day in Sedona, poor me. I come all this way to see clouds? Shouldn’t the sky be rolling its blue carpet pour moi everyday? Anyways I somehow got over it by eleven. We headed back to Chocolatree, where I’m suspecting the goddess eats too. 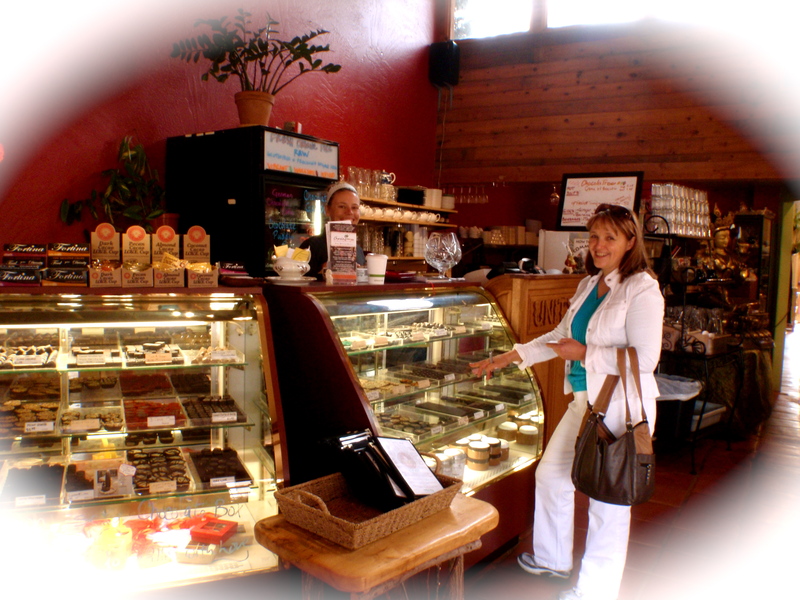 We picked out delectable chocolates for evening dessert and an almond decaf chai late with agave. The warmhearted friendly waitress suggested “hip yuppy” places to check out in Sedona, the non-tourist kind, and so we went. Maman in the Chocolatree selecting Chocolate L.O.V.E. Cups for evening dessert. First stop: Urban Gypsy were modern meets vintage with the best pricing: A little bit for all price ranges. Whom ever does the ordering for this store, big kudos! Second stop: Crystal Magic where my mom overheard the clerks talking about seeing “something” in the sky last night, UFO sighting occur quite frequently in this region. I on the other hand scored an exquisite leather carrying case for my charmed one. Magical store indeed. Third Stop: Sedona’s first Hot Yoga studio. It opened up merely 2 months ago. Their studio was small, quaint and friendly and operated with 2 teachers it seemed. Fourth stop: lunch at Chocolatree, quite shocking really. Apparently there was no better place to eat, so why bother? We ate a fine superfood nutrient rich lunch accompanied by Kombucha. The cook invited us to stroll in their back yard where we found a blossoming almond tree. Very clutch! 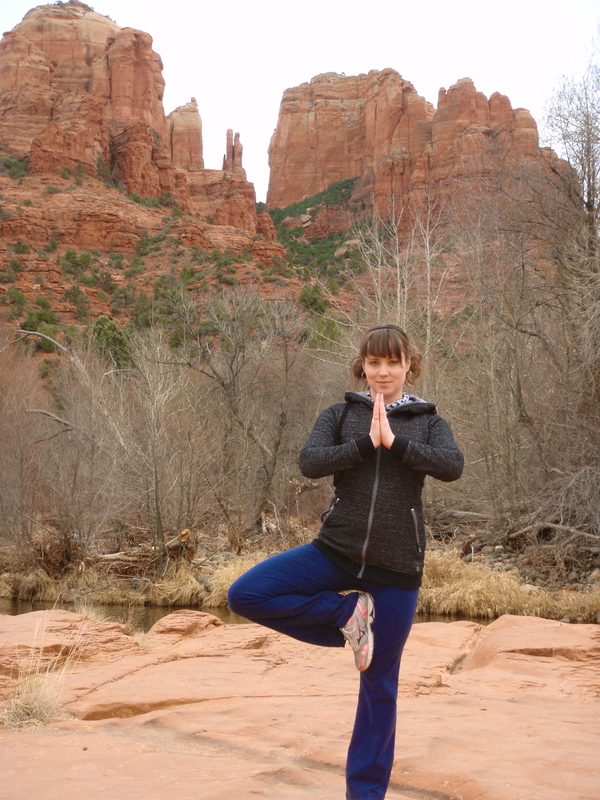 Following the "yoga everywhere" trend with Tree pose in one of Sedona's National Parks. Fifth stop: Crescent Moon National Park. It was a short walk where big trees and grassland were the major attraction. Something quite usual in Edmonton, although the backdrop definitely not usual of Edmonton. We took it upon ourselves to start modeling yoga poses for the camera, a most fun activity with amazing scenery. Sixth stop: the lets pressure you to buy a time share presentation where vacationing is the most popular verb ever. Seventh stop: my Uncle George’s amazing ribs. Yum-me. They were so tender they fell off the bone just as they entered our mouth. They were so flavourful the taste teased the pallet endlessly. His trick: boiling the ribs for 2 hours in water, lemon juice, teriyaki sauce, pickling spice and herbes de provence and then covering them in 3 different BBQ sauces with hickory smoke on the BBQ for 5 or so minutes. Mmm. I ate surrounded by extended family listening to their entertaining stories. I mindfully appreciate this time. Another great day. Another great adventure. Only thing is, I have no internet to post this. Dang.